Analysis of midge remains in late-Quaternary sediment, recovered from a lake situated north of treeline in northeast Siberia, indicates the occurrence of notable climatic fluctuations during the last 12 ka. The onset of late-glacial warming was disrupted by a marked cooling event – possibly correlative with the Younger Dryas – that occurred between 11,000 and 10,000 yr BP. Increases in the relative abundance of taxa typically found in tundra lakes, such as Hydrobaenus/Oliveridia and Parakiefferiella nigra, and the concurrent decrease in temperate taxa, such as Microtendipes and Corynocera ambigua, suggest climatic deterioration occurred during this interval. 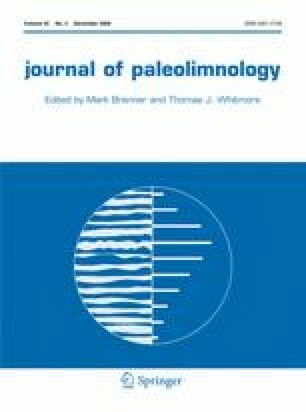 At approximately 10,000 yr BP there was a large increase in temperate taxa such as Microtendipes and C. ambigua, and a decline of essentially all cold-water taxa. This suggests that climate was warmer than present since the modern distribution of both Microtendipes and C. ambigua is limited to forested sites in this region. This warm interval lasted until approximately 6000 yr BP when there was a precipitous decline in temperate chironomid taxa and an increase in cold-water chironomid taxa, such as Paracladius, Hydrobaenus/Oliveridia, Abiskomyia, and Parakiefferiella nigra. This cooling continued through the late-Holocene and the modern tundra chironomid assemblage developed by approximately 1400 yr BP.